The National Park Service celebrated its 100th anniversary Thursday morning with a celebration at the Washington Monument. To kick off the bash, more than 1,000 people assembled on the National Mall to hold brown, green and white umbrellas to form the NPS' iconic arrowhead logo. The NPS took an aerial photograph of the emblem and shared it on the National Mall and Memorial Parks website and social media. 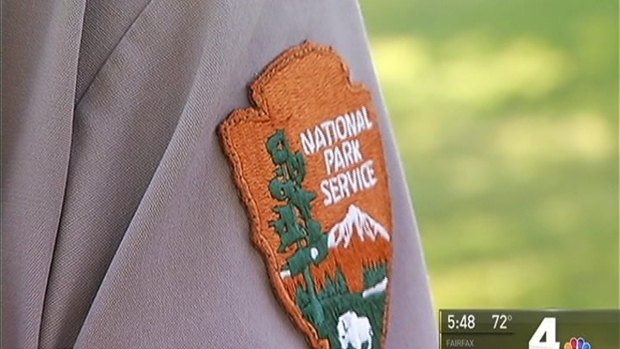 The NPS says its emblem contains elements symbolizing the major facets of the national park system. A Sequoia tree and bison represent vegetation and wildlife, mountains and water represent scenery and recreation and the arrowhead shape represents history and archaeology. The C&O Canal National Historical Park will also offer free mule-drawn boat rides to mark the centennial. The park said in a statement that the canal boat rides at the Great Falls Tavern Visitor Center in Potomac are free on Thursday. The rides normally cost $5 to $8 per person. Other centennial events Thursday in the Mid-Atlantic region include naturalization ceremonies at Fort McHenry in Baltimore and at the World War II Memorial in Washington. National parks across the country are offering free admission, birthday cake, ranger talks and other special events to mark the 100th birthday of the National Park Service. .News4's Meagan Fitzgerald has more on the celebration.